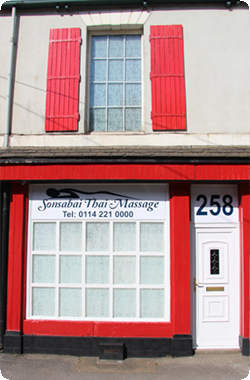 Sonsabai is a luxury massage parlour situated in Hillsborough, Sheffield. We are 5 minutes away from the City Centre. At Sonsabai, a 1st class service is provided by high class ladies in a luxurious, comfortable and relaxed environment. We provide traditional Thai Massage, Body to Body and Nuru Massage. Sonsabai offers 3 luxurious and spacious rooms, two of the rooms feature large whirlpool jacuzzi baths and the other room provides a luxury 2 person steam shower cabin. All the rooms are tastefully furnished and at Sonsabai we pride ourselves on the cleanliness of our establishment and are committed at all times at providing our customers with the finest and most memorable experience possible. At Sonsabai we are committed to helping prevent the cynical exploitation of vulnerable and underage women by criminal elements within the industry and fully endorse and support the work of Redline UK.